What happened in Curuguaty? 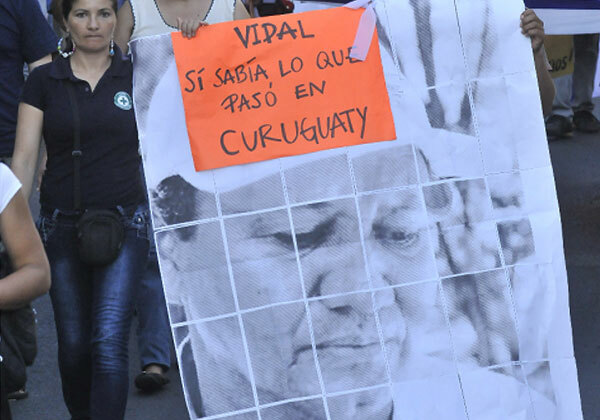 That’s the question that has been lingering in the minds of many Paraguayans after the controversial death of Vidal Vega, the peasant leader who was a key witness to the investigations of the Curuguaty massacre. Vidal Vega, 48, leader of a landless peasant movement in Paraguay was shot four times on December 1 2012, by bullets from a 12-gauge shotgun and a 38-caliber revolver fired by two unidentified men who sped away on a motorcycle, according to an official report prepared at the police headquarters in the provincial capital of Curuguaty. Vidal Vega was a key witness in an investigation into the Curuguaty massacre on June 15, 2012, where 11 peasants and 6 policemen died. These events led to the impeachment of former Paraguayan President Fernando Lugo over his handling of the situation, who ended up being ousted from office. Vega was expected to be a witness at the criminal trial, since he was among the few leaders who weren’t killed in the clash or jailed afterward. He was not charged because he was away getting supplies when the violence erupted. “We think he was assassinated by hit men who were sent, we don’t know by whom, perhaps to frighten us and frustrate our fight to recover the state lands that were illegally taken by Riquelme,” Martina Paredes another peasant leader. Vega had lobbied the government for many years to redistribute some of the land that the Colorado party senator Blas Riquelme, who died of natural causes in July, began occupying in the 1960s. Riquelme occupied the land during the dictatorship of Alfredo Stroessner, whose government gave away land for free to members of his inner circle. Stroessner’s land policy exacerbated Paraguay’s highly unequal system of land distribution, where 2.5% of the population owns 85% of the land. Vega’s murder comes shortly after the presentation of the findings of an alternative investigation of the massacre of Curuguaty, presented by the Platform of Research on Peasant Conflicts (PEICC, by its Spanish initials). A team of researchers led by the Spanish jurist Aitor Jiménez Martínez carried out the investigations. According to one of the lawyers in the investigation, Vidal Vega was instrumental to the PEICC research. Many of the important files that used the PEICC as evidence in its report, which gained international notoriety, were provided by Vidal Vega. Public opinion has remained deeply divided over the tragic events of Curuguaty. The incident and subsequent political crisis radically changed the nation’s political situation, threatening an already weak governability and immersing the country into political isolation from regional neighbours. As Paraguayan analyst Milda Rivarola masterfully explains, the events of Curuguaty completely shattered the already eroding social contract, accepted by society after the fall of Stroessner, based on rule of law, parliamentary democracy, peaceful resolution of social conflicts and the fact that the president ascends to power not by coups, rigged elections, minorities manoeuvres or monarchical succession, but by popular vote. The consequences of the events in Curuguaty and now the murder of Vidal Vega mean that it is likely social unrest will continue in Paraguay, especially in the coming months. With elections rapidly approaching in April 2013, social and political tensions will potentially increase. Paraguayan authorities find themselves at crossroads and need to make a crucial decision that will shape the political future of the nation. One path is to try to deliver clear and reliable answers to the events of Curuguaty and provide sustainable long-term solutions to some of the structural problems that afflict the country with land tenure being at the forefront. The other is to continue to deny the situation and face the consequences of increasing social tensions and popular frustration. After confronting the most severe political crisis of the past twenty years, Paraguay now has the unique opportunity to redefine its future, reshape and reconstruct its social contract and build the basis for political, economic and social development. The clock is ticking and time is running out. The next six months with reveal what path the nation chooses.